These Ohm Forks work like kinetic energy to move disharmony and tension from the body, while restoring a sense of well-being. Made of space grade aluminium, our Ohm Tuning Forks will not go out of tune, and hold the vibration well after being activated. 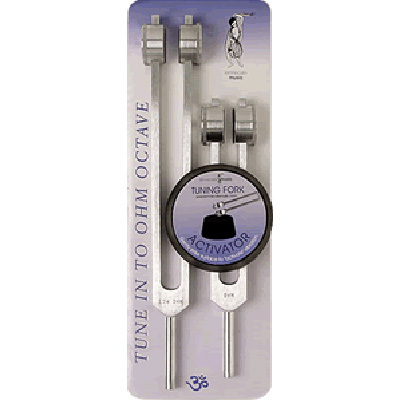 Package includes a Mid-Ohm (136.10 hz) and a Low-Ohm (68.05 hz) Tuning Fork, Activator, Overview of Sound Healing, plus information about Octaves & Overtones, and Instruction Booklet. When activated together, these two Ohm tones create the Ohm Octave, a beautiful musical interval. The Ohm tone is an excellent beginning for those interested in Sound Healing, and is the chosen tone used by seasoned Sound Healers. The vibration of Ohm is calming, grounding & energizing. Sound Healing can enhance breathing, relieve body tension, assist in pain management and meditation & help facilitate yoga poses. These Ohm Forks work like kinetic energy to move disharmony and tension from the body, while restoring a sense of well-being. Made of space grade aluminium, our Ohm Tuning Forks will not go out of tune, and hold the vibration well after being activated.